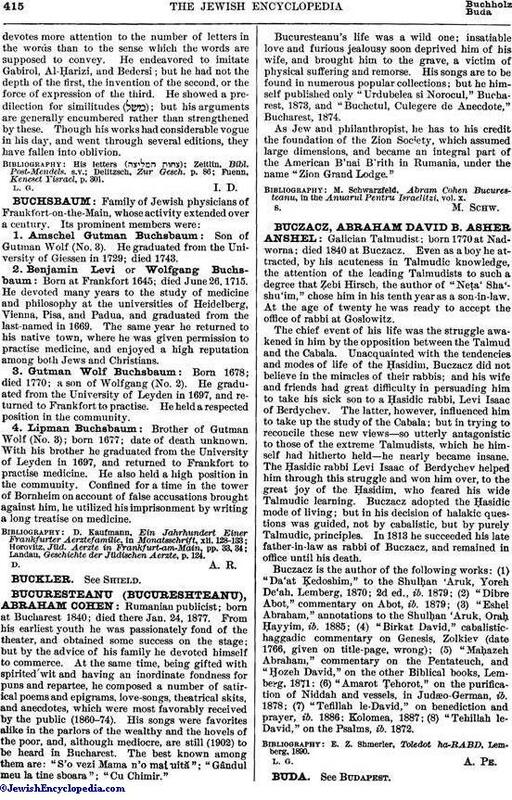 Rumanian publicist; born at Bucharest 1840; died there Jan. 24, 1877. From his earliest youth he was passionately fond of the theater, and obtained some success on the stage; but by the advice of his family he devoted himself to commerce. At the same time, being gifted with spirited wit and having an inordinate fondness for puns and repartee, he composed a number of satirical poems and epigrams, love-songs, theatrical skits, and anecdotes, which were most favorably received by the public (1860-74). His songs were favorites alike in the parlors of the wealthy and the hovels of the poor, and, although mediocre, are still (1902) to be heard in Bucharest. The best known among them are: "S'o vezi Mama n'o mai uită"; "Gândul meu la tine sboara"; "Cu Chimir." Bucuresteanu's life was a wild one; insatiable love and furious jealousy soon deprived him of his wife, and brought him to the grave, a victim of physical suffering and remorse. His songs are to be found in numerous popular collections; but he himself published only "Urdubelea si Norocul," Bucharest, 1873, and "Buchetul, Culegere de Anecdote," Bucharest, 1874. As Jew and philanthropist, he has to his credit the foundation of the Zion Society, which assumed large dimensions, and became an integral part of the American B'nai B'rith in Rumania, under the name "Zion Grand Lodge." M. Schwarzfeld, Abram Cohen Bucuresteanu, in the Anuarul Pentru Israelitzi, vol. x.